The Japan Association for the Promotion of Arts (JAPA) was established in 1981 with the objective to promote far and wide interaction in fine arts, to foster creative activities founded on the traditions of Japanese culture, as well as to exchange works of art with other foreign countries that will contribute to the improvement and development of the culture of fine arts in Japan. With this aim in mind, this association has been carrying out various activities. In regard to the international exchange in the culture of fine arts, we have held Japanese Art Program at Leiden University (the oldest faculty of Japanese studies in Europe, which was founded in 1855) in the Netherlands from 2005, and have sent artists as lecturers. 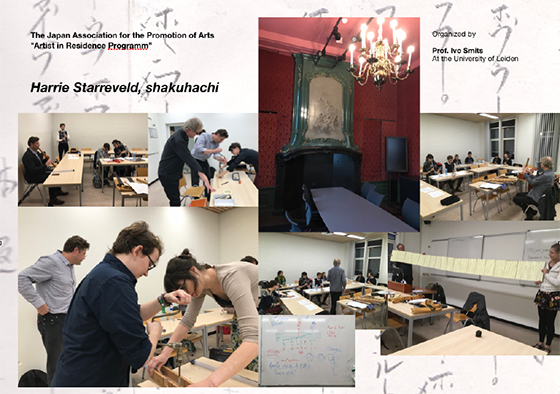 We held the program that covered history, theory and practice comprehensively in the fields of Japanese art in Leiden University to promote understanding of Japanese art in foreign countries, leading to great success. With an aim to expand the field of performing arts, we will hold our 11th lecture “Shakuhachi” in the fall of 2017. This is a continuing series of lectures at Leiden University, beginning from our 9th lecture, “Gagaku (Japanese traditional music and dance)”, which was held in February of last year. This time we are inviting Professor Harrie Starreveld as a lecturer. 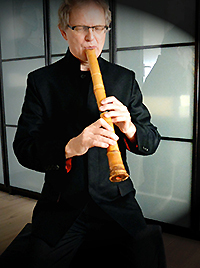 Professor Harrie Starreveld is an artist in resident of Netherland, who is also a well-known flutist and Shakuhachi player. Please check the details of our lectures at the Leiden university website. We are also holding a “Japanese Art Seminar,” an open lecture for the purpose of wider audiences beyond the students of the Japanese Art Program at Leiden University for their deeper understanding of Japanese culture. The Japanese Art Seminar is also open to those outside the campus, so we are sure that it is a precious opportunity to deepen others understanding of Japanese culture. We welcome everyone to participate in this occasion. Professor Harrie Starreveld studied flute at the Sweelinck Conservatory in Amsterdam. In 1978 he was a winner of the International Gaudeamus Competition for contemporary music. Today Harrie Starreveld is widely regarded as one of the worlds leading specialists in contemporary flute music, working with many composers including Elliot Carter, Franco Donati, Brian Ferneyhough, Isang Yun, Pierre Boulez, George Crumb. He is a member of the Nieuw Ensemble and Atlas ensemble from the Netherlands. Together with Rene Eckhardt and bass-clarinetist extraordinaire Harry Sparnaay he formed Het Trio. As a soloist he played the flute concertos of Donatoni (Puppenspiel), J. Schwantnner, P. Boulez, P. Schoenfield, L.Berio, A. Jolivet, C.Nielsen and I. Ibert. He regularly performs for the Dutch radio and Television and gave recitals all over the world in America, China, Australia, Taiwan, Korea, Japan, Hong-Kong and many countries in Europe. Since 1980, Starreveld has been professor of flute at the Sweelinck Conservatory in Amsterdam and Bremen, regularly gives masterclasses in Spain, Austria, England, Taiwan, Korea, Belgium, Estland and the U.S.A. He recorded music of several composers on 45 CD’s. Harrie Starreveld is specialized in Zen-shakuhachi he did his Zen study with Ikkei Hanada. Copyright © 2002-2018 The Japan Association for the Promotion of Arts, All Rights Reserved.